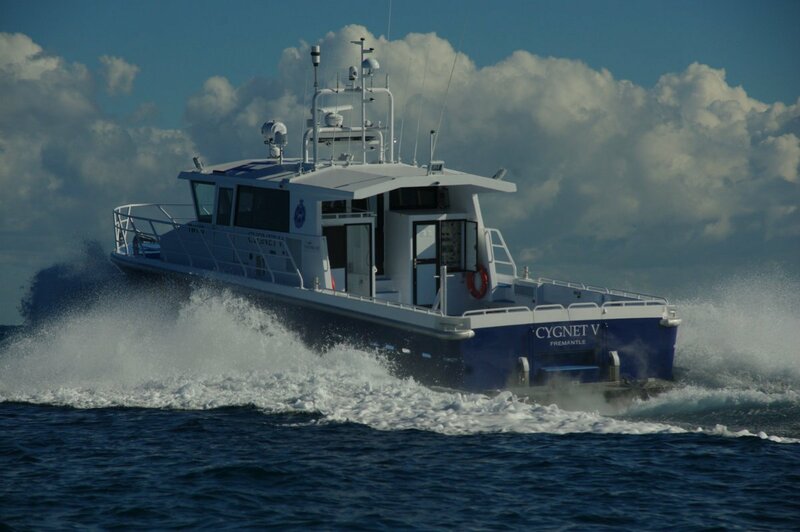 ‘Cygnet V’ is the first large patrol boat to be built expressly for WA Water Police, and over a seven month planning period they made sure that she would redress the shortcomings of earlier vessels. Multi functional is barely adequate for this maid of all work. The selected builder was Shoreline Marine Fabrication. This company is the spiritual successor to Imax which in turn evolved from Image after it merged with Austal. There is a long and unbroken line of talent and commitment to the industry. The Water Police are unanimous in their praise for the vessel Shoreline crafted for them. ‘Cygnet V’ is 17.7m by 5.2m, with the function of every square centimeter planned. Power is supplied by a pair of Caterpillar C18s rated at 1,000hp each; with an operational zone between Esperance and Shark Bay range is a key factor, and fuel capacity is 5,000 litres. Strength too is important and the structure features closer frame spacing and heavier stringers than called for by the national rules. Maximum possibility simplicity was a key aim. This is relative, of course, in a vessel equipped for so many roles. 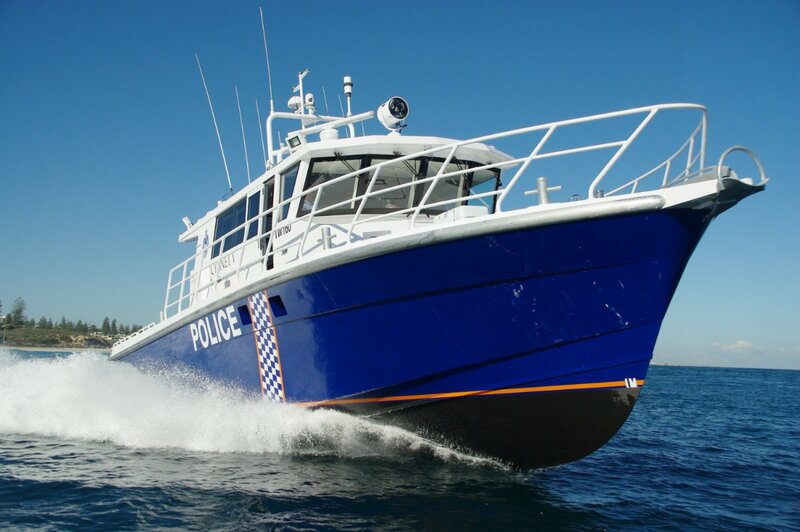 WA has the same tasks as other states for their water police vessels as well as some unique ones: escorting major aquatic events, transporting emergency reinforcements to Rottnest Island, and escorting visiting US warships accounts for some of those. 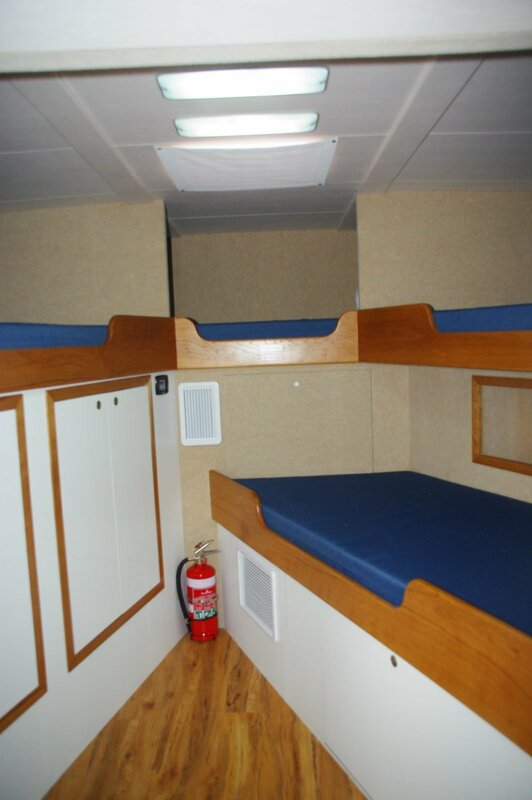 The basic crew is two with accommodation for two more, and the survey is for 20 special personnel in addition. The accommodation like everything else on board is functional and sufficient without coming close to excessive. 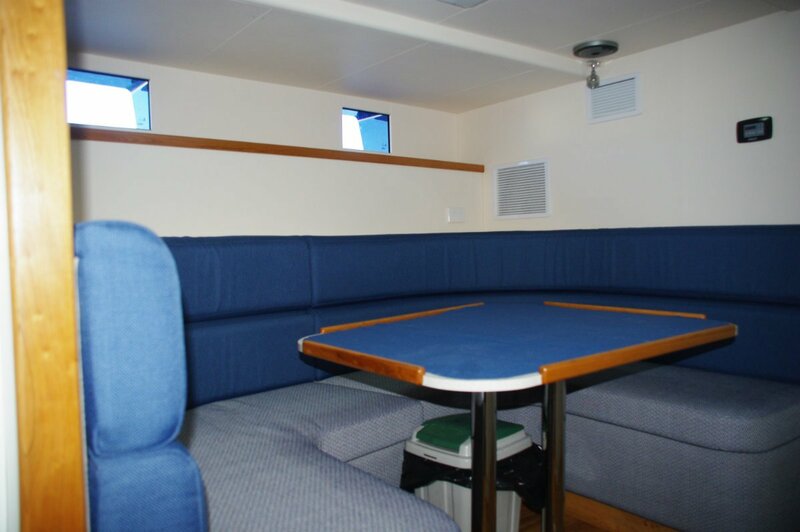 In the forepeak is a four-berth bunk room, and aft of it a galley-mess room capable of preparing and disposing of meals but not attracting long stays. The bathroom is located off the main deck – where all people with small vessel experience prefer it. The large wheelhouse, provided with forward raked windscreens and abundant overhead grab rails, is divided into functional nooks. Forward starboard is the master’s helming station, forward port the navigation and communications centre, and aft port the search and rescue co-ordination centre, all equipped with the latest and best electronics in integrated systems that are completely logical in use. The SAR corner has the same access to the central police computer as a police station, and even better communications. 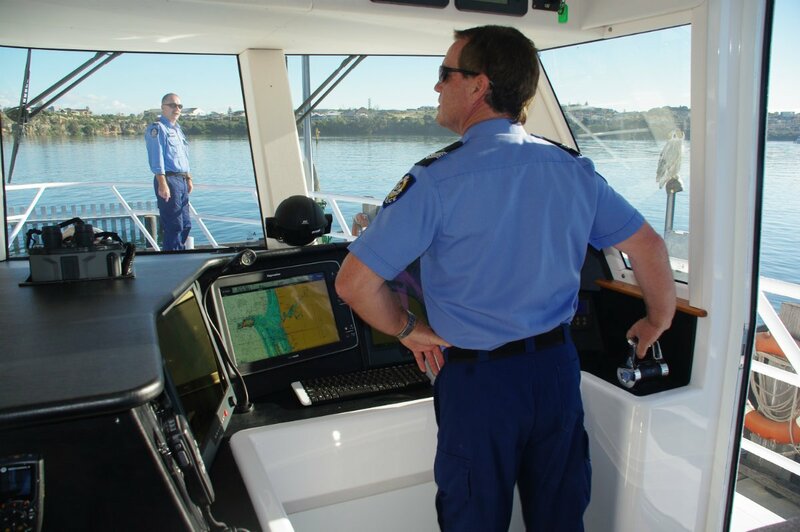 The navigation and communication equipment of the dedicated navigator are duplicated as separate entities; on board computers and screens provide for planning and conducting searches. All information is transmitted to the master’s panel, and can be displayed on an overhead screen for briefing rescue volunteers. After the briefing the plan can be printed out for the volunteers to take to their own vessels. The navigator has massed electronics including radar of stupefying capability, internet and satphone as well as a full suite of radios. He also controls forward looking infra red and a 45 million candlepower spotlight. Always in the past the Police Dive Squad has had to bring their equipment on board for every task, previous boats not being rigged or plumbed for the role. ‘Cygnet V’ has changed all that; now the only items to be brought on are personal equipment. Below the after deck is a three-phase compressor delivering air to two G-sized cylinders and with feeds for portable cylinders. At the rear of the superstructure is the dive panel distributing air to individual hoses and providing a control point for the diving operation. 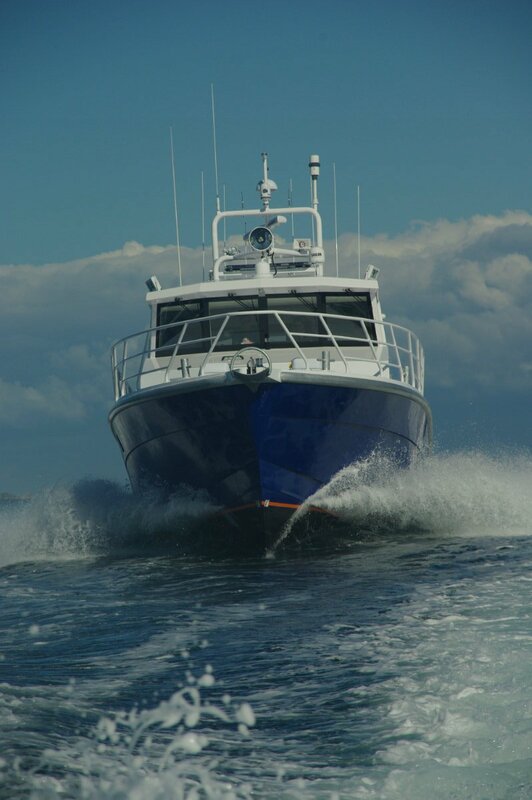 One vital diving requirement – space – is provided by the large clear deck area with the hydraulic dive platform at the rear. 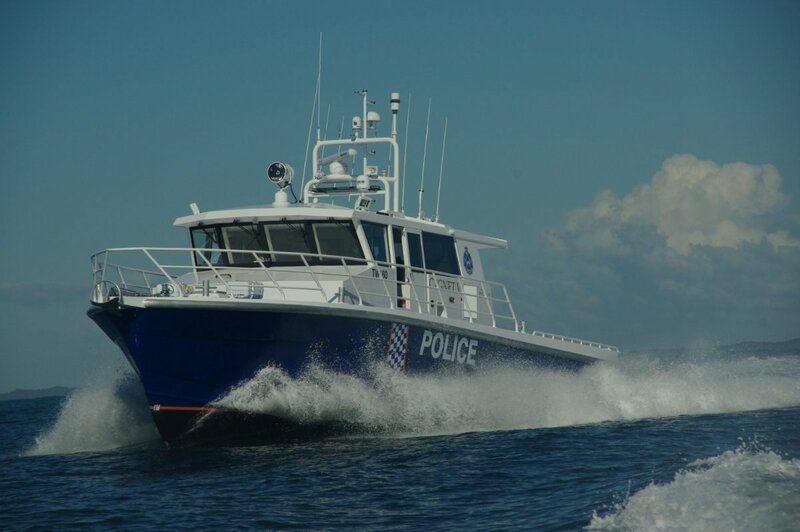 At times a police vessel needs exceptional agility. Aiming at this requirement the builder fitted ‘Cygnet V’ with the V-section rudders more commonly seen on ultra high speed vessels. On trials the immediate response to helm and the tightness of the turning circle were outstanding. 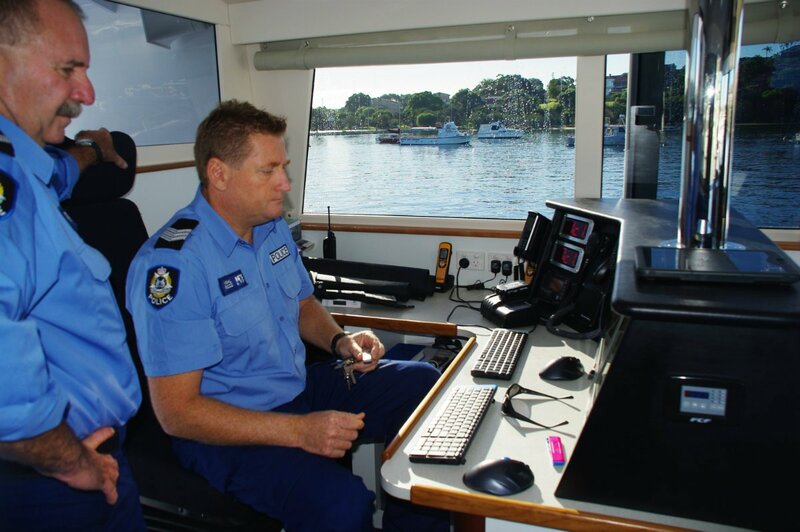 The Water Police now has what is almost certainly the most capable and longest ranged police vessel in Australia, and is set for a long working life.